Fanning was an American sailor who rose to captain several voyages to the South Pacific, China and the far southern oceans. Typically he would set out from the U.S. to the far south in search of fur seals. Collecting a load of seal hides and sometimes oil he would then sell the cargo in China and return with a cargo of Chinese goods to sell in the U.S. He gives a good general overview of the seal hunting process , as well as the types of seals and the areas where they were hunted. Additionally he gives accounts of collection of Sandalwood and "Beach La Mer" (sea cucumbers) for the Chinese market. 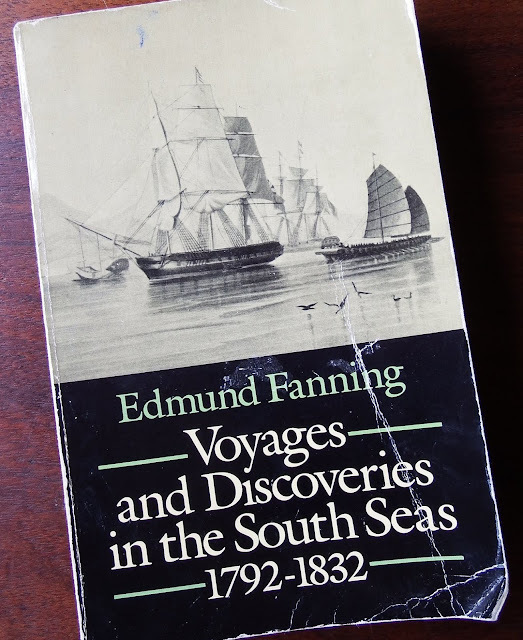 Fanning also relates his difficulties dealing with the Chinese authorities, adventures among the islanders of the Pacific, his arrest and near execution in Chile and many other interesting events. While the book is not a fast paced "page turner" it is a very excellent and readable historic account of merchant shipping in the Pacific. While the book is not a fast paced "page turner" it is a very excellent and readable historic account of merchant shipping in the Pacific. Ooh, thanks for this recommend! I talk about the Pacific fur trade in my history course and this will be helpful.